Where do you hold your meetings? Where can I purchase a ukulele in Austin? I love those fabulous Austin Ukulele Society t-shirts. How can I buy one? Just show up at one of our monthly meetings! There is no fee to participate. All are welcome to join – from beginners to experienced players. Contact us if you would like to be added to our mailing list. We’ll keep you up-to-date on our meetings and other ukulele-related activities around Austin. We meet on the second Thursday of each month, 7:00 to 9:00pm. (From time to time we meet on a different day of the month, so please do check this website to be sure.) During our meetings we have group sing-and-strum-a-longs and educational sessions; we learn a new song at every meeting. We also set aside time for a brief “open mic” for individuals to get up and share a solo tune (purely voluntary!). 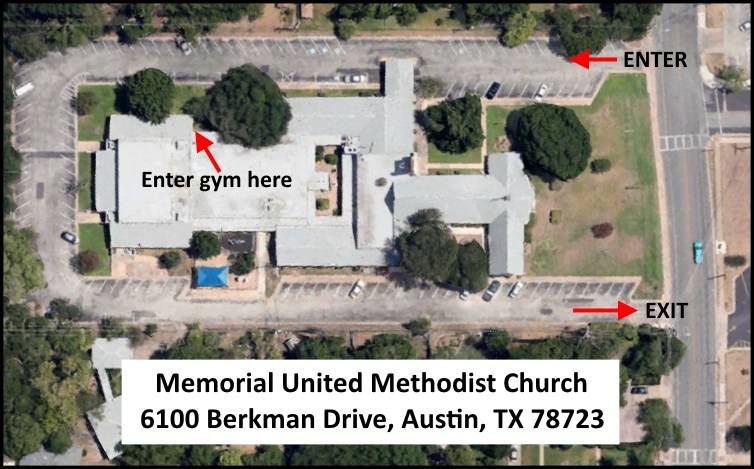 Our meetings take place at the Memorial United Methodist Church located at 6100 Berkman Drive, Austin, TX 78723. We meet in the gym. Austin Ukulele Society t-shirts can be purchased at our monthly meetings on the second Thursday of each month. To make sure we have a particular size and style available at a meeting, we recommend contacting us in advance. To place an online order, contact us, tell us which shirts you’re interested in, and we’ll discuss payment options with you.